The Helsinki orchestra under Leif Segerstam are eminently well served by the Ondine engineers. Leif Segerstam guides the Helsinki Philharmonic through magnificently convincing readings of both works in the acoustically ideal Finlandia Hall, with the organ soloist, Kari Jussila, doing a knock-out job in Annunciations. The whole recording is demonstration quality from start to finish. Don't miss it! Leif Segerstams Klangsinn, seine schwelgerische Beherrschung des grossen Apparats sind hier optimal plaziert. If there is any justice in the music world, Ondine's release of two contrasting symphonic works should convince more conductors to program Rautavaara's music. They would, I'm sure, find a ready and enthusiastic public for it. Kari Jussila rises to the various challenges set for him with what sounds like genuine enthusiasm (...) while Leif Segerstam and the Helsinki Philharmonic fully exploit the tonal drama of both works. Kari Jussila is the thrilling soloist in a sensitively balanced recording. 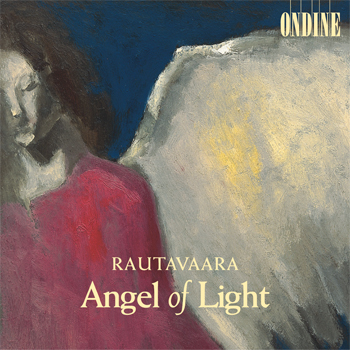 This fourth release in a cycle of Einojuhani Rautavaara's complete symphonies couples the Finnish composer's most successful symphonic work, Angel of Light, with the concerto for organ, brass quintet and symphonic wind orchestra, Annunciations. Leif Segerstam conducts the Helsinki Philharmonic Orchestra. The seventh symphony was commissioned by the Bloomington Symphony Orchestra to celebrate its 25th anniversary in 1995. It completes Rautavaara's 'Angels Series' which includes the orchestral work Angels and Visitations (1978) and the double bass concerto Angel of Dusk (1980). Annunciations was composed in 1976-77 for the Stockholm Organ Festival, and the triple forces required by the instrumentation were proposed by the commissioning organisation. Its first Finnish performance inspired a critic to write about the Finale that it brought to mind the Pasolini film in which "drunken noblemen roll around on the keyboard of an organ." The virtuoso organ part is performed by soloist Kari Jussila at the organ of Helsinki's Finlandia Hall. This recording became an international best-seller and spurred Rautavaara to considerable international fame, including in 1997 a GRAMMY nomination and a Cannes Classical Award as 'Best Disc of Music by a Living Composer'.